Save the Pacific Northwest Tree Octopus!! decimation of habitat by logging and suburban encroachment; building of roads that cut off access to the water which it needs for spawning; predation by foreign species such as house cats; and booming populations of its natural predators, including the bald eagle and sasquatch. 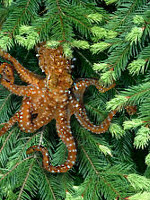 Please go immediately to Save the Pacific Northwest Tree Octopus Foundation to learn more about this intelligent and fragile species and learn what you can do to conserve this rarity! A recent study published in American Naturalist demonstrate an interesting evolutionary trade-off between "force" and "fit" in carabid beetles (Damaster blaptoides) that feed on land snails. Force means the beetles are stout, large-head and able to crush snail shells with powerful jaws. Alternatively, they can be slender, small-headed and able to fit into the aperature of snail shells (as in the above photo). 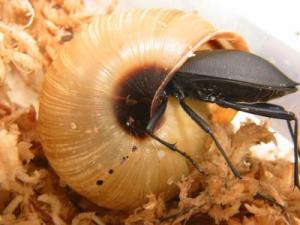 Large headed beetles were most successful with thin-shelled snail, whereas small-headed beetles were more successful on snails with larger aperatures. It has been demonstrated that the same trade-off diversifies shell morphology in studies of freshwater snails, where elongate shells are adaptive in protecting against entry attacks and rounded shells are adaptive in protecting against crushing attacks. Functional trade-offs are likely to affect coevolution between the prey's defensive characters and the predator's attack characters. Thus, the trade-offs between force and fit could play a significant role in character diversification through coevolution between snails and their predators. High school 7th grade kids rapping about invertebrates! "We ain't got no b-bone" Kind of catchy! Admittedly poor quality and can't make out what they say some of the time, but cute nonetheless. It warms my heart to see the youth of America so enthusiastic over my beloved inverts. Using feathers from museum collections all over the world, a University of Guelph integrative biology professor has tested a new hypothesis about what led to population decline of a species of seabirds in Canada. Prof. Ryan Norris conducted a historical analysis of museum specimens of marbled murrelets going back more than a century to examine how dietary changes may have affected the seabirds’ numbers. The study, which will be published in the August issue of Journal of Applied Ecology, also illustrates how scientists can use museum specimens to figure out what led to a species decline and to help focus conservation efforts. “One of the biggest unknowns for endangered or threatened species is how their populations fluctuated naturally before human disturbances,” Norris said. Norris decided to examine how marine diet over the last 100 years might have influenced the birds’ populations by analyzing the stable carbon and stable nitrogen isotopes, chemical signatures that become fixed into the marbled murrelets feathers when they’re grown. Their isotope analysis showed that prior to 1900, the birds were feeding most on fish, but that by the 1970s, 80s and 90s, their diet consisted of marine invertebrates, which are much less energetically rich than fish. “Murrelets have to catch around 80 to 100 marine invertebrates to get the same nutritional value as in one forage fish,” Norris said. The researchers concluded that the seabirds’ population changes in Canada after 1950 were likely influenced by a decline in the amount of fish in their diet. It’s an important finding because it suggests that to save the species, conservation efforts should be refocused. 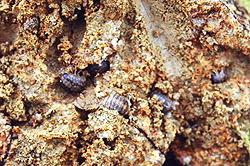 This is a new species of Bathyacmaea (Mollusca, Gastropoda, Patellogastropoda, Acmaeidae) that currently under description by Takenori Sasaki at the University of Tokyo Museum in Japan. I have found hundreds of these individuals in my quantitative collections of chemoautotrophic communities at the Lau Basin hydrothermal vent fields. They reminded me of the Patella limpet I learned about in my undergrad inverts class. Photo credit: Yuji Okimura, emeritus professor at Hiroshima University. "...the highest peak has almost completely vanished, leaving only one rocky protrusion about 6 meters high. Because of this, most of the island is submerged at full tide." Let us rejoice in the awe and mystery of those without spines! It is my pleasure to start this blog on the unappreciated majority in the animal kingdom: the invertebrates! My blog will be focusing on anything and everything related to spineless curiosities. My specialty is in deep-sea marine invertebrates, so you may notice a slight bias but never fear as I am interested in all of the 95% of life we call Invertebrate! I always welcome links and suggestions to post regarding inverts and will answer any questions about invertebrate organisms readers will post. 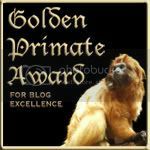 I hope this will be an educational and informative blog as well as entertaining.